I really need to read this. You really do. I picked it up a couple weeks ago so I could know a bit about it before I went into the movie. It’s the first graphic novel I’d read. I was very impressed. It’s like a movie so good you rewind it to watch scenes over again (e.g. 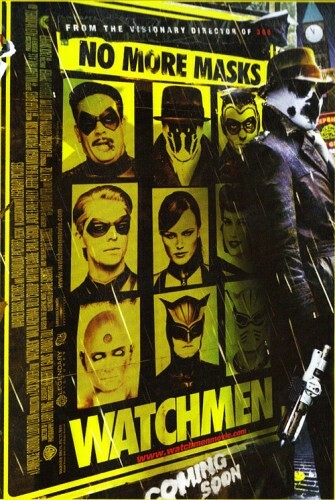 most scenes with Rorschach, star of this poster). I read this a long time ago but the comics went with my exhubby so when I found out about the movie I bought the book and reread it. Good stuff. The Watchmen is the kind of graphic novel that transcends the comic book genre. If it had been released as a straight novel instead of graphic novel (i.e. without pictures), I think it still would have become a classic. The movie lasts 163 minutes… 2 hours 43 minutes for the timely impaired. I shall enjoy every second of it. yes, you do. it’s a beautifully thought-out story. I read it a couple days ago. If anything I think the comic book type format was probably the worst format for it, and its still a great read. BUT two of the people on the poster behind Rorschach aren’t wearing masks?????!!!!!!!!! Why are there two (Dan Dreiberg) Nite Owls? I’m not even counting Hollis Mason, there’s Dreiberg & Dreiberg down there in the corner. Who says there should be no more masks? I say there should be multi-masks! Thet was mwnt for Mayyday. Evil must be punished. Even in the face of armageddon. Now that I think about it, I’m not pretty sure that the people who haven’t read the comics will enjoy the movie.. I mean for me, this is the type of story where you need to go through at least twice in order to understand and appreciate it much better, so I really think that for those of you planning to see the movie.. read the comics first! !